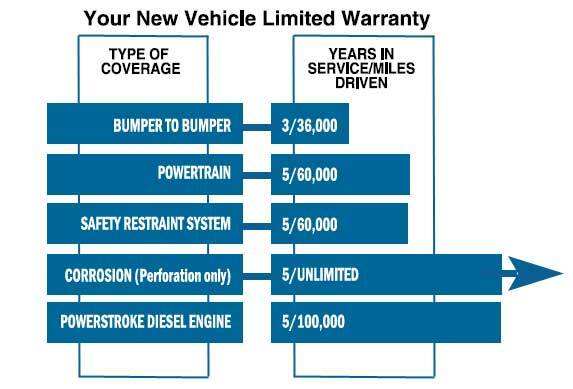 2016 Ford Warranty - What´s Covered & What Isn´t. Everyone knows that their new Ford comes with a 3 year/36,000 mile bumper-to-bumper warranty and most people will tell you that it covers everything except routine maintenance. If that´s true, than why does Ford call it a "limited" warranty? 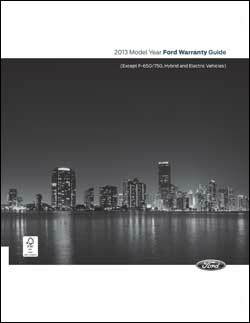 You are given a Warranty Guide when you purchase any new Ford vehicle, but did you read it or did you just make assumptions on what is covered and what your resposibilities are. We provide this page not to be referred to instead of your warranty guide, but just as a brief overview of some information you may have missed when reading it. We hope that by gleaning through the information here you will have a better understanding of your warranty, your rights and your responsibilities. You may have an implied warranty of merchantability that the car or light truck is reasonably fit for the general purpose for which it was sold. These implied warranties do not apply at all if you use your vehicle for business or commercial purposes. In addition, the implied warranty of fitness for a particular purpose does not apply if your vehicle is used for racing, even if the vehicle is equipped for racing. It is your responsibility to make sure that all of the scheduled maintenance is performed and that the materials used meet Ford engineering specifications. Failure to perform scheduled maintenance as specified in the Owner´s Manual will invalidate warranty coverage on parts affected by the lack of maintenance. Make sure that receipts for completed maintenance work are retained with the vehicle and confirmation of maintenance work is always entered in your Owner´s Manual. Some states and/or local governments may require a tax on a portion of warranty repairs. Where applicable law allows, the tax must be paid by you, the owner of the vehicle. Your vehicle´s safety belts and air bag Supplemental Restraint System (SRS) are covered for an extended Safety Restraint Coverage Period, which lasts for five years or 60,000 miles, whichever occurs first. Your vehicle´s body sheet metal panels are covered for an extended Corrosion Coverage Period, which lasts for five years, regardless of miles driven. The extended warranty coverage only applies if a body sheet metal panel becomes perforated due to corrosion during normal use due to a manufacturing defect in factory-supplied materials or factory Workmanship. If aluminum body panels have corrosion or rust damage, and the damage is not the result of abnormal usage, vehicle accident, customer actions and/or extreme environmental conditions, the corrosion or rust damage repairs are covered for 5 years, unlimited miles. For damage caused by airborne material (environmental fallout) where there is no factory-related defect involved and therefore no warranty - our policy is to provide free repair of paint damage due to the airborne material for 12 months or 12,000 miles, whichever occurs first. The New Vehicle Limited Warranty covers tire defects (not tread wear or damage) in factory supplied material or workmanship for 100% of labor costs and on a pro rata adjustment basis for parts. The tire manufacturer also provides you with a separate tire warranty that may extend beyond the New Vehicle Limited Warranty coverage. You will find the manufacturer´s tire warranty with the owner literature supplied with your vehicle. You have the option of having a tire warranty repair performed by the tire manufacturer´s authorized service center. Aftermarket parts or components, sometimes installed by Ford Motor Company or an authorized Ford dealership, may not be covered by the New Vehicle Limited Warranty. Any damage caused to Ford components due to the failure of aftermarket parts (other than a certified emissions part) is not covered. the installation or use of a non-Ford Motor Company part or software (other than a certified emissions part or software) or any part or software (Ford or non-Ford) designed for off-road use only installed after the vehicle leaves the control of Ford Motor Company, if the installed part fails or causes a Ford part to fail. Examples include, but are not limited to lift kits, oversized tires, roll bars, cellular phones, alarm systems, automatic starting systems and performance-enhancing powertrain components or software and performance "chips". Your vehicle may allow, enable or facilitate the use of certain non-Ford Motor Company software. Ford is not responsible for the functionality of such software. Ford may disallow, discontinue or modify your ability to use such software at any time without prior notification or incurring any warranty or other obligation. Non-Ford Motor Company software may be governed by End User License Agreement or warranty provided by the software provider. windshield stress cracks. However, limited coverage on windshield stress cracks will be provided for the first 12 months or 12,000 miles (which ever occurs first), even though caused by use and/or exposure to the elements. ¹Wiper blade replacements will be provided during the first six months in service, regardless of miles driven. ²Wheel alignments and tire balancing will be provided during the first 12 months or 12,000 miles in service, whichever occurs first. ³Brake pad/lining replacements will be provided during the first 12 months or 18,000 miles in service, whichever occurs first.